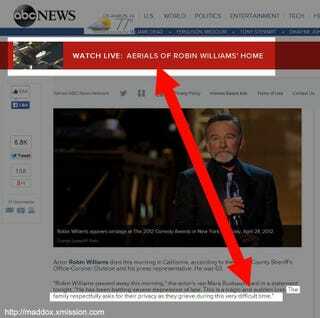 ABC Offers Live Aerial Footage of Robin Williams' Home Because Why? In the scramble to cover yesterday's horrible and shocking news that Robin Williams was dead, apparently by his own hand — and in the absence of any hard information other than the fact that he died from asphyxiation and his family has asked that we respect their privacy — ABC decided that the best way to cover the event was not with nostalgic Mork and Mindy or Mrs. Doubtfire clips, but an invasive live feed of aerial images of the Williams' family home. It's fair and reasonable to show an image of the home — the location of an international celebrity's death is newsworthy, like it or not — but it's a garbage strategy to send a helicopter to pointlessly hover over that location when it's a private residence with a grieving family inside, as you're simultaneously reporting that Williams' family has asked that you refrain from doing exactly what you are doing. So what's the information they're trying to provide with continuous, live aerial footage? What do we need to see live? Hey, there was a dead body in this here house just a few hours earlier, look at how the breeze rustles the leaves of the late Robin Williams' trees! Or maybe it's Hey, look how fancy and rich this guy was, and there's a car driving by! But all you get is Hey, look at how we don't even read our own website. "When we realized there was no news value to the live stream, we took it down immediately. Our intention was not to be insensitive to his family, friends and fans, and for that we apologize."